Publication Date: 19th September 2017. I didn't love the first book, but I've heard that this one is more fast-paced so I'm happy about that. (The slowness was what ruined the first book for me). I'm also so excited to see how the Queens have changed and what's in store for them! The first book certainly ended on an intense note. 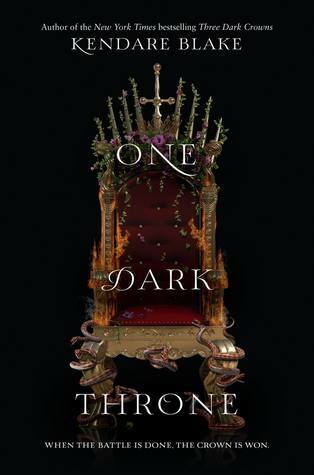 Anyone else excited for One Dark Throne? This was my choice for Waiting on Wednesday last week. I didn't know it was going to be more fast-paced than the first novel. Now, I really can't wait to get my hands on it. I haven't read the first few books of this series yet, but it sounds interesting! Great pick! Ooh nice! I feel like the weirdo who didn't totally love Three Dark Crowns. I was actually a little confused with it at many points, but alas, I find I will still give this one a try before totally giving up! I actually hated book one so I didn't think I would read this one. :/ I got an ARC from the pub but it was unsolicited so I still don't think I will read it but the possibility is there. :D I hope you enjoy this book when you get the chance to read it! Ah no I'm sorry about that :( Thanks, though! I've already pre-ordered my copy of this book. I can't wait till it comes in! I hope we both enjoy this one :) Cant wait to see what you think. Yes!! So excited for this one! Can't wait to see where the story goes after that ending! Yay! And I know right?! Such a cliffhanger! I haven't read the first but I DO want to read this series. I'm so curious. See I didn't completely love the first one either (it was a 3 star read for me because of the slowness) but that ending had me dying to know what happened next. Great pick, Amy! Sorry you were disappointed too :( I also gave it 3 stars. Oh my gosh yes this book is the BOMB. I like the overall sound of the plot but I just can't deal with slow books! If you found the first one slow I dread to think what I'd do! Nice covers though. for my liking too. But, the ending was brilliant and I am really looking forward to what happens next. Yeah me too! Hope we both love this one.